Miki Jacobs, is an internationally renowned medium, author, and speaker. She was born in Israel, and grew up in a conservative Jewish home. She served as a Sergeant in the Israeli army for three years before moving to the United States and starting a business she owned for eighteen years. It was during her time in the business world that her abilities and interest in spirituality rather than religion began to emerge. Both of these defining experiences have had an impact on her spiritual journey. Miki has introduced the concept of a person's "Team" (Angels, Spirit Guides, and departed loved ones) in her teaching around the world. Miki has made it her mission to transfer their important messages to people that we are NEVER alone, and that every one of us, has a team of wise and powerful, divine helpers assigned to us from birth to death in order to guide and support us in our soul's journey here on Earth. 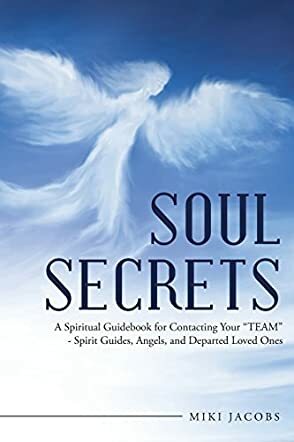 Soul Secrets by Miki Jacobs is an interesting and useful spiritual guide meant for people interested in contacting their soul "team," which includes spirit guides, guardian angels and departed ones. What I love about this book is that it is a simple guide which first explains the author’s journey to becoming a medium and contacting angels, and then proceeds to describe practical ways in which people can contact their “team.” I think this book is highly relevant at a time when many people are stressed and undergoing difficulties and are interested in contacting higher beings for guidance, support and healing. The book encourages people to experience contact with these beings themselves, rather than having blind belief. It also contains lots of advice for improving vitality and energy, which is in itself important for spiritual progress. The language is easy to follow and the advice is concise and comprehensive. The spiritual and philosophical implication of the presence of higher beings is also explained. We all can reflect on how wonderful it is that God has sent angels to guide us and protect us, since our souls have incarnated to learn and grow spiritually. Understanding the big picture and our role in it is in itself a big step in spiritual progress, which is covered adequately by this book. I hope that readers will find this an inspiring book and definitely learn to call for help and support in troubled times. I also loved the concept of a team, since many people would feel less alone and troubled if they knew that they had a team always there to support and help them.